Many Manchesterites are aware of the William M. Jutras Post #43, an American Legion Post that has been around since 1919. But not many outside of that organization can tell you much about the man the post is named after. In addition, at the location where the Jutras Post building originally sat (228 McGregor Street), a plaque can be found in McGregor Park in the northwest corner of Amory and McGregor Streets. That plaque reads: “LT. WILLIAM H. JUTRAS. CO. A 103rd INF. 26th. DIV. KILLED IN ACTION SEPT 26 1918 AT RIAVILLE. FRANCE. AGE 26. The President of the United States of America, authorized by Act of Congress, July 9, 1918, takes pride in presenting the Distinguished Service Cross (Posthumously) to First Lieutenant (Infantry) William M. Jutras, United States Army, for extraordinary heroism in action while serving with 103d Infantry Regiment, 26th Division, A.E.F., near Riaville, France, 26 September 1918. When the platoon on the right flank of his company was threatened by an enfilading movement of enemy machine guns, Lieutenant Jutras carried a message to the commander of that platoon through deadly machine gun and minenwerfer bombardment. It then being necessary to establish liaison with the company on the right in order to save this platoon from annihilation, and knowing that he faced almost certain death, this gallant officer unhesitatingly volunteered for this mission and crossed a terrain swept by converging machine gun fire. Mortally wounded, he delivered his message in time to save his platoon. William Hilair Jutras, son of Alfred & Mattie/Martha (Barbeau) Jutras was born 19 September 1891 in Peterborough, Hillsborough Co. NH. By 1900 the Jutras family had moved, and were living in Manchester NH at 377 Carter Street. William’s father was a roofer by trade (as was his own grandfather). William probably attended the local schools, and then began working in a local grocery. In June 1917 at time of his military registration for World War I, he indicated he had formerly been a shoe worker at J.M. Hoyt Co. This form shows William’s birth year as 1890, and that he had been serving already for 8 years. This leads me to believe that when he originally enlisted in New Hampshire’s National Guard’s 1st NH Infantry [about 1909] he probably indicated on paperwork that he was a year older in order, as he was underage. 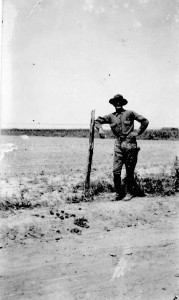 For the Mexican border crisis of 1916, New Hampshire deployed one infantry regiment (1st NH Regiment, Company A) to Laredo, Texas, and William M. Jutras was with them. 58,664 Guardsmen had been mobilized from every state (except Nevada which had no National Guard in 1916) by President Woodrow Wilson to guard the U.S.-Mexico border against bandit raids from Mexico. When America entered WWI (1917-1918), the 1st New Hampshire Infantry sailed to France and became the First Army Headquarters Regiment. Most of the rest of the state militia was assigned to the 26th Division and fought in six campaigns in France. Lt. William H. Jutras was assigned to 26th Division, 103d Infantry, Company A, also known as the “Yankee Division” for its preponderance of the division’s New England origins. The book, “With the Yankee division in France,” by Frank Palmer Sibley, published in 1919, goes into great detail about what the brave men, including William H. Jutras, experienced in Europe, so I will not repeat most of what is printed there. What is known from the citation above, is that he risked and lost his life for his platoon. An addendum to the story is that three men–Andreas Nilsen (a Red Cross man from North Dakota), Cyrus Wallace (of Dexter, Maine) and Corporal Herve L’Heureux (of Manchester NH) volunteered to help recover the badly wounded Jutras from the battlefield, despite the grave dangers. 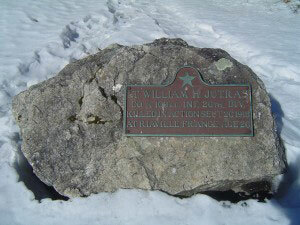 They were successful, William H. Jutras delivered his message to save his platoon, but he died shortly afterwards. He received the Distinguished Service Cross posthumously (see newspaper notice below). JUTRAS, LT. WILLIAM H., 185 Beech Street, Manchester, N.H. A Company, 103d infantry. Unofficial. Lieutenant William Hilair Jutras of Company A, Old Lafayette Guards, 103d Infantry, died September 26 from wounds received in action, a telegram received last night from the war department announced. The word came to his parents, Mr. and Mrs. Alfred Jutras of 185 Beech Street. The local officer who has been in the Lafayette Guards nine years, was made First Lieutenant but two months ago. He had held the rank of Second Lieutenant for some time. He is the second Manchester Officer to give his life for his country. Lieutenant Donor Genard [Editors Note: Aimee D. Genard] of the same company dying early in the summer. Lieutenant Jutras’ name had not been in a casualty list among those wounded. It is believed he received his death wound in the Saint Mihiel battle. In the last letter from him, dated September 8, he wrote that he was well. “Don’t worry,” wrote Jutras,”I am always enjoying the best of health and am always on the job. Believe me, I love it. This is the life for a man who wants to work and you can imagine how proud I am of my commission as First Lieutenant.” The soldier stated in the same letter that they were not working hard then. He said he was living in a “chateaux” 18 feet under ground. “However we are not complaining at all, we have plenty to eat and we are comfortable for the time being. We have traveled almost to the four corners of this country and since we have been overseas, I have seen many beautiful places. Coming here we passed the village of Barleduc. First we were at Liffol-le-grand, in the Vosges, which we left February 4 for the Toul sector, but we are far from that place now.” Lieutenant Jutras was 27 years of age. He was a shoemaker, conducting a cobbler shop until the time he went to the Mexican border. Upon returning from Texas he went to work in a shoe factory. 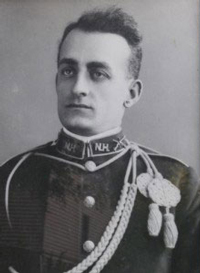 His long association with the Lafayette Guards made him one of the best known of the younger military officers in the city. He leaves, besides his parents, two brothers, Ernest and Romeo, and two sisters, Aldea and Rosalma. View of William H. Jutras flag draped casket, St. Raphael’s Parish. The casket is on a caisson with soldiers on both sides of the street. MHA Photoprint Collection, Manchester Historical Association. The funeral Lieutenant William Hilair Jutras of this city, who was killed in action during the famous Saint Mihiel drive and whose body was returned to this country for burial, was held Sunday afternoon in what is considered to be the largest attended military funeral that has been conducted in this state since the World War. Governor Albert Q. Brown, unable to attend the funeral on account of official duties, sent the following telegram to the Jutras Post Officers: “I shall be unable to stand with you at the bier of Lieutenant Jutras, but his name and fame will remain with me while memory endures. Let us bear to mind that it is not length of life, but the fullness that makes for service and for glory. Congressman Burroughs, in opening, pointed out how “wholly cheap and inadequate” were any words to express the sentiments of those attending and himself. They were there, he added, to pay the homage of respect to one who gave all he had to give–even to his life–for the institutions and ideals of America. Following the beautiful ceremonies at the Post Hall, came the funeral procession to Saint Augustin’s Church, and from there to the cemetary. At the church, Father L. A. Ramsay, a former army chaplain and chaplin of the Jutras Post, was the officiating clergyman and delivered the oration. He was assisted by Father C. M. Burque as deacon and four former servicemen. The servicemen who assisted at the church were, George Robitaille, Ernest Bernir, Adelmore Letendre, and Wilfred Remillard. 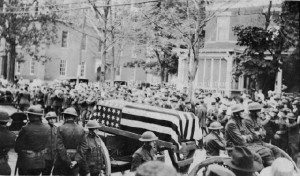 At the cemetary, five buglars sounded “Taps” and as the body was lowered into the grave white carnations were thrown upon the casket by the members of the Ladies Auxiliary of the Jutras and Sweeny Posts. B. C. Lambert and Company were in charge of funeral arrangements. Manchester, N.H. Dec 11–Mrs. 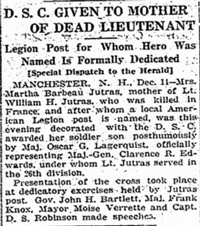 Martha Barbeau Jutras, mother of Lt. William H. Jutras, who was killed in France, and after whom a local American Legion post is named, was this evening decorated with the D.S.C. awarded her soldier son posthumously by Maj. Oscar G. Lagerquiest, officially representing Maj.-Gen. Clarence R. Edwards, under whom Lt. Jutras served in the 26th division. Presentation of the cross took place at dedicatory exercises held by Jutras post. Gov. John H. Bartlett, Maj. Frank Knox, Mayor Moise Verrette and Capt. D.S. Robinson made speeches.